My copy was warped beyond belief. Have trouble believing that a pressing plant didn't catch it coming out. Have emailed Runt/Plain Recordings to see about getting a new copy. This is Evan Dando at his very best! Still a great album, years after release! I've always loved this album and picked it up when it came out on CD in the early 90s. I've long been wanting to add it to my collection on vinyl but was hesitant due to some of the derogatory comments I'd read about the Plain Recordings label. I can't speak to other PR releases, but I just finished listening to both sides and it sounds really great! Nice quiet, noiseless pressing on green vinyl. I'll add that I wasn't fussy about getting it on green but it was the only version my local store had on hand. Nonetheless, it's looks great and sounds great as well. This record sounds great...i know Plain gets a bad rap but they did this one justice...their version of Primus' Pork Soda is really good too.I wonder if they used a better pressing plant back in 2009. Another winner from Music On Vinyl. Don't know if it's all analogue or not. I guess is not, but I don't care because is so much fun to hear this music again on vinyl. Please double check your barcode #. 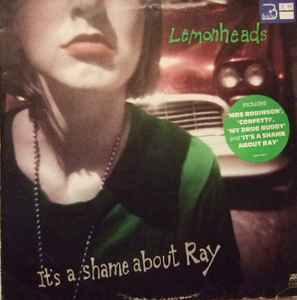 I have a feeling that this is really the same as https://www.discogs.com/Lemonheads-Its-A-Shame-About-Ray/release/4867906.